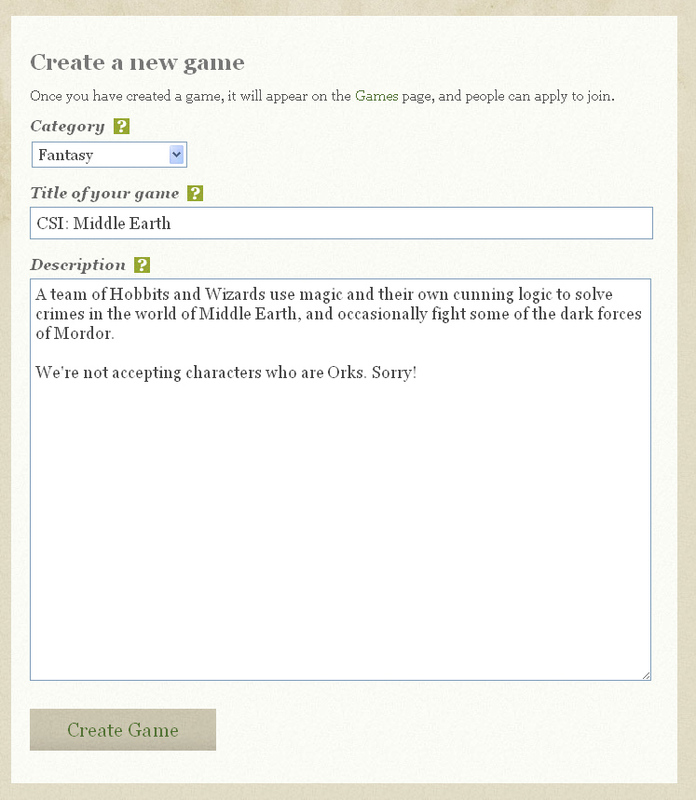 Ever wanted to run your own roleplaying game? There are many ways you can run your game, either using a forum, or creating an email newsgroup, or using a Yahoo Group. OngoingWorlds has been specifically created for roleplaying games, so it’s better than trying to get a forum or Yahoo Group to do something it wasn’t intended for. With Ongoing Worlds, you’ll be able to approve pending members with a simple click, and this will automatically put their character profile into the Character List. Also as a Moderator, you’ll be able to edit the questions that you ask new members when they apply to join. On the Ongoing Worlds website, click “Create Game” at the top. You need to login for the next step. If you already have an account login with your username and password. If you’re a new user, click register now. You’ll now see the screen where you’ll enter most of the details about your game. There are three fields to fill in on this page. There’s a question mark next to each of them, press this to reveal some description for each option. From this dropdown box, choose the category which best fits the game you’re creating. The box will list the most popular, but the options will be generic, like Fantasy, Sci-Fi, Modern, etc. This is the title that will appear at the top of your game’s homepage, and above your game’s listing on the “All Games” page. It will also appear on any email that is sent out to your members. It’s important to make this as relevant to your game as possible, and eye-catching to the members you want to join your game. Here is a place where you can write about your game. Describe as much as possible like the setting, mention if you game is based on anything, and write any special instructions or rules that you want members to follow. This description text will be shown on your game’s homepage, and the first few lines will be shown on your games listing on the “All Games” page so be as concise as possible, but make your game sound interesting enough for people to want to join. When you’re happy with the title and description press “Create Game”. Don’t worry, you will be able to change any of these details later if you make a mistake. You’ll now see your game’s homepage. As your game is brand new, you won’t have any characters or members yet, so you’ll see some messages saying you haven’t yet got any characters, members or posts. Don’t worry, you can add these at any time. If you made a mistake and want to change your game’s name or description, click “Edit Description” and you’ll see a form similar to the one when you first created the game. If you haven’t yet, go here and create a new game.